One of the things that I love the most about spending the summers in Berlin (apart from avoiding the New Zealand winters) is the access to inexpensive, organic whole foods. Clearly, I like to dabble in ancient grains and when I go to a supermarket or even a drugstore here, the aisles are packed with interesting and über-healthy types of flour, cereals, grains and vegan products. Here, I really am in super foodie heaven. A product that I’ve been experimenting with lately is puffed amaranth. If I’m not having it for breakfast simply with fruit, milk and a touch of honey, I’m adding it to my super fruity Bircher muesli recipe for extra goodness. Amaranth is a silent-type super food that you may have spotted hanging about on the bottom shelf at your local health food store. However insignificant it may appear, it really does work in extraordinary ways. Amaranth is actually a seed or “pseudo-grain”, which has been a staple food in numerous cultures for centuries. In fact, the Aztecs regarded it as having supernatural powers and used it in religious ceremonies by forming a paste out of amaranth and honey and creating an image of a particular god they were worshipping. Once formed, the image of the god was broken up and shared between the worshippers to eat. This “food of the gods” is gluten-free, very high in protein and easily digested. It is also rich in vitamins, containing vitamin A, vitamin B6, vitamin K and folate. Minerals present include manganese, copper, calcium, iron, magnesium, phosphorous and potassium. Another super food that I’ve encountered in Berlin is the aronia berry, or chokeberry, as it is sometimes referred. The aronia berry is a native to North America and is being hailed for its amazing super food properties. Research has suggested that presently it has the highest concentration of antioxidants in any fruit. Aronia berries also have an extremely high concentration of flavonoids, which help the body fight against disease. They are known to improve circulation and have a good dose of quinic acid, which can prevent urinary infection – helpful and nutritious! So, these wunderbars really are a wunder. They are prepared in a flash and are generally made up of ingredients that you would have lying about in the nether regions of your pantry (with the exception of the aronia berries). They also provide you with extreme nutrients to ensure that you power through the afternoon without resorting to making evils at your irritating colleague, or Beau, who you’ve been living in a shoe box with for far too long. Mix all of the dry ingredients together in a large bowl. Heat the wet ingredients in a saucepan until a liquid consistency is reached, right before boiling point. Combine the wet ingredients with the dry ingredients until it resembles a divine mass of goodness. Push into a form and pop into the fridge for a few hours to solidify. 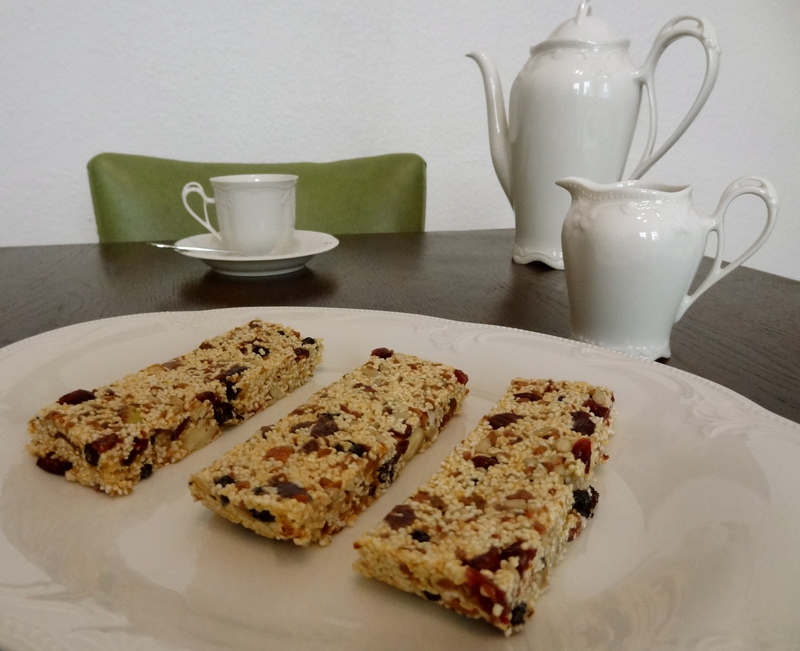 Cut into bars and eat for breakfast, lunch or simply when you’re having a “moment”. Keep refrigerated for the perfect wunder bar. Oh wow, those look super good and super healthy! Thanks! Yeah they are super easy to make, healthy and totally yummo.